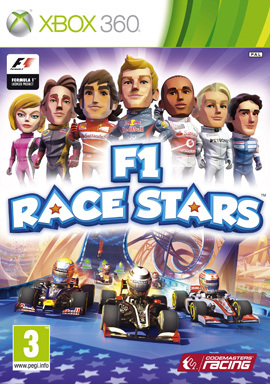 Codemasters Racing – the guys behind the popular Formula One and DiRT games – have got a new game called F1 Race Stars that lets you race as your F1 heroes in but not as you might expect! You can race along famous circuits transformed to feature jumps, loop-the-loops and shortcuts. Plus there are all sorts of cool power-ups you can collect to overtake your rivals! And when you think you’re good enough, you can take on your friends in the split-screen mode or take on people across the world in 12 plaer online races. We’ve got hold of a bunch of screenshots for the game to show you the types of things you can expect!